Players in the Premier League receive a fine of £10 per red card and £15 additionally for every 5 yellow cards received. These fines are administration fees and are imposed by the Football Association. A player who receives a red card is also given a suspension. These rules are set for every tier of football across England including the EPL and Championship all they way down to Sunday League games. The FA is also responsible for other disciplinary action. If you are interested in more information about red and yellow cards then check out my YouTube video on How yellow and red cards work in soccer. ← How Much are Fines for Getting a Yellow Card in the English Premier League? wow. that’s much cheaper than I expected. I think that it should a percentage, even 1 or 2% of their pay. 10 pounds really? that’s like losing a penny. Who cares? According to http://www.trophy4toon.co.uk/salaries.html Mario Balotelli (pictured above getting the red) made 4 million pounds last season. Imagine if that moment, pictured above, had cost him 2% of that. For those who can do the math, that would have come to 80,000 pounds. That seems like more of a deterrent than a few games ban and a really forgettable fine. 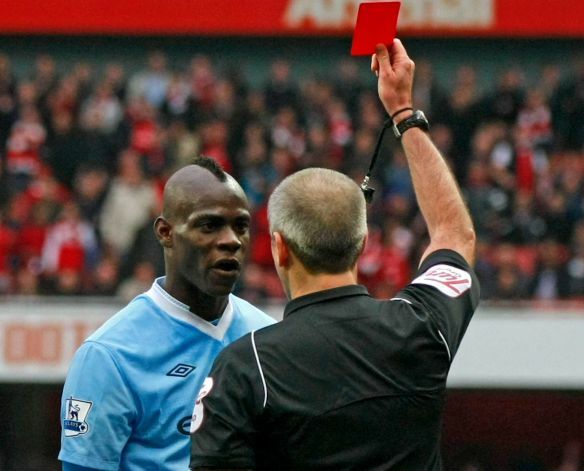 Home » Facts and Stats » How Much are Fines for Getting a Red Card in the English Premier League?